I stand at the foot of the glass mountain. Its sheer, hard wall sloping upward, the crest beyond my sight. Many a knight and his horse have clambered up its side, striving for the pinnacle and its prize, only to lose their footing and slide back down to their harm or death. How many glass mountains are there? Maybe as many as there are people. For me, the most devious of glass mountains appears in the Grimm tale Old Rinkrank. In this tale, as the princess and her suitor climb, she slips; the glass mountain opens up and swallows her. She is found by Old Rinkrank in the cave she falls into. He offers her death or servitude. As his servant, she washes his dishes, makes his bed, and grows old. He takes to calling her Mother Mansrot. Every day Old Rinkrank takes his ladder out of his pocket, using it to climb to the top of mountain, and pulls the ladder up behind him. Every evening he returns with gold and silver to add to his hoard. One day Mother Mansrot washes his dishes, makes his bed, then shuts all the doors and windows, except one small window. She refuses to open up when Rinkrank returns. He looks through the small window to see what she is up to, and she slams the window sash on his beard. Trapped, he must surrender the ladder. After climbing to the top of the mountain, she releases him by pulling on a long rope. Returning to her father and betrothed, she tells them what has happened to her. The king condemns Old Rinkrank to death, taking his gold and silver. The princess finally marries, and they live in splendor and joy. There are numerous glass mountain stories. They harken back to Brunhilda’s deliverance from the Hall of Flame, protected by a wall of shields atop Mount Hindarfjall, which only the horse Grani could reach. Usually the variants involve a princess sitting on top of the glass mountain, often holding a golden apple, to which knights on horseback must ascend. In Old Rinkrank, the accoutrements have fallen away. No golden apple, no horses. The princess is climbing with her young man when she slips and falls into the mountain, which opens up to receive her. Not unlike The Turnip Princess, of which I have spoken before, the images and connections in Old Rinkrank are surreal, suggesting the art of literary correctness has not been applied to this tale. It is close to its rude, peasant origins. I am sure there is no edifice in fairy world more dangerous than the glass mountain. Mine towers over me, reflecting the sun to the point of blindness. I can’t see the shards of crystal that make up its face, jagged, razor-like, waiting for me to put my hand on them. The princess of Old Rinkrank fell into her glass mountain. One moment she is beside the man she adores. 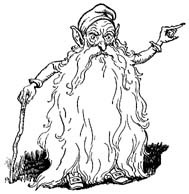 In the next she finds herself in a dark cave, facing an old man with a long gray beard, who holds her life in his hands. Did she slip and fall because of her own carelessness, or was the fall an inevitable result of her venture? In either case the event happens with disconcerting suddenness, with little recourse. The story states, “When she had spent many years with him and had become very old, he called her Mother Mansrot, and she had to call him Old Rinkrank.” Therein lies the uniqueness of this tale, and nothing less than its horror. Many a fairy tale ends in marriage, as does this one. Typically, the princess falls into a deathlike sleep from a bite of poison apple lodged in her throat, or swoons for a hundred years after pricking her finger on a spindle. I don’t know of any version where the princess grows old, except in Old Rinkrank. In most of the princess tales, the heroine goes through a transformation, if only into other clothing. They might hide who they truly are, but none of these pretty girls lose their identity, lose themselves, and become “Mother Mansrot.” This name is put upon the entrapped princess by her captor. He has redefined her. Adding to the injury, she “had to call him Old Rinkrank.” This was not an exchange of fond nicknames. Through naming her, and dictating how he is to be called, he demands complete control. The story cannot be a fairy tale unless our protagonist finds a way out of her dilemma. Mother Mansrot manages to turn her captivity into escape. Here is the second unique feature of our story. Having lost control, the princess takes it back without the aid of a prince or a magical helper. She succeeds by her own devices. The final surprise comes when, after all these years, she returns to her father and her betrothed. They are still there. What comes to mind is the use of time in the Celtic tales, where a day in the fairy world is a year in reality. I am tempted to think a year in the glass mountain is only a day in our time. But the story does not say that, and I’d be missing the point. Her former identity, her former world, remained suspended until she resolved her conflict, however long that took her. I’ll play the part of Bruno Bettelheim, and put words in his mouth. The conflict and struggle between Mother Mansrot and Old Rinkrank reflects the internal struggle of an individual in whom the authoritarian superego (Rinkrank) has subjugated the id (the princess’s wants and desires) until the ego (in a burst of tenacity) releases the superego’s stranglehold and restores equilibrium, allowing the individual to reintegrate their personality. I know a better explanation of this story. In my mind’s eye, I see an ancient Mother Goose, sitting close to the hearth to keep herself warm, weaving a tale for her listeners, who are young, old, some of her blood, some not. The story is taken from glass mountain tales she has heard; it is taken as well from her long struggle as a woman in a male-dominated world, reshaping both into part cautionary tale, part critique of her culture, and a plea for equality. The cottage in which she told the tale has long disappeared, the hearth stones cold and scattered, but her story and her struggle remain. Unbidden, Old Rinkrank and Through the Looking Glass conflate in my thoughts. If you will forgive my undisciplined reasoning, I’ll argue for the connections between the two stories. I’ll take the Reverend’s word on this. Most striking to me is that both stories depend on surreal images, creating their dreamlike existences. At one point, Alice is in a shop attended by a sheep who sits contentedly knitting. The shelves are filled with merchandise, but appear empty when Alice looks directly at them. The princess lives in Old Rinkrank’s house, which is in a cave or is a cave, at the foot of a mountain, which is the glass mountain, or inside the glass mountain. Hard to tell where the house is, or if there really is anything on the shelves. 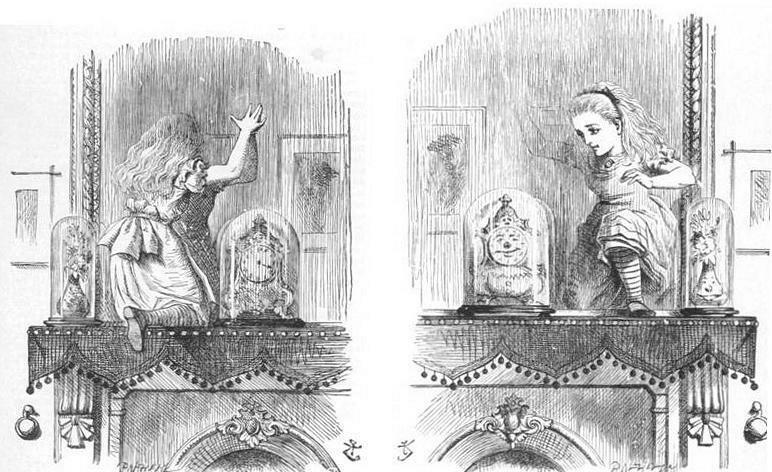 Alice goes through the mirror by climbing up onto the fireplace mantle. Once inside the mirror she becomes a pawn in a large chess game, and eventually forgets her name when wandering in a forest with a fawn as companion. 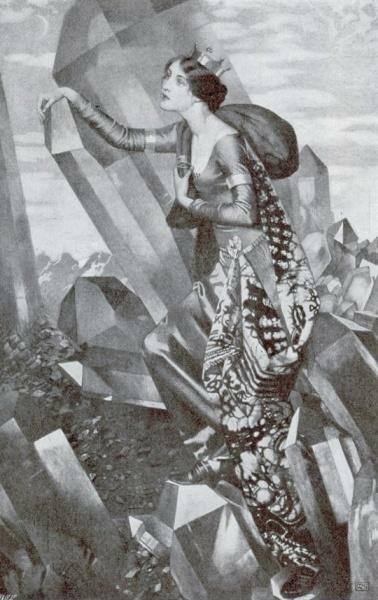 The princess enters the glass mountain while attempting to climb to its top. She loses all her royal status and becomes a servant to a gray-bearded man. Her name is forgotten when she becomes Mother Mansrot. Alice is pushed around by most of the characters in her story, including flowers. The princess is pushed around by her sole detractor, Old Rinkrank. Near the conclusion, Alice, now a queen, pulls the tablecloth out from under the chaotic feast. The princess, now in control, climbs the ladder and pulls on the rope. Likely, all these similarities are coincidental. Perhaps Lewis Carroll read Old Rinkrank. I want to think that he and my ancient Mother Goose were tapping into the same subconscious stream of thought, both recognizing that dreams deal with personal conflicts in their own illusive way. Maybe there are racial memories that people hold in common. That the same symbols come up again and again with similar meanings does point to a shared body of images. Glass is one of those images, reflecting our features back at us, but in reverse of our reality. Magic mirrors have a way of distorting and also challenging us. Looking at my glass mountain, I can see the ghostly outline of myself on the surface. Tentatively, I put my foot on the crystalline rock, and take my first step upward.